Use the options available in the Preferences tab to customize the behaviour of the Service Launcher. Displays the location path of the Service Launcher application on your computer. You can click on the ellipses button, at the end of the field, to browse for a new location. Launch on login Check this option if you would like to launch the Service Launcher application every time you login to your computer. This enables the Display Window option. Display window Check this option if you would like to the Service Launcher window to open when the Service Launcher is launched on login. Otherwise, the Service Launcher application will run in the background and be accessible to open through your computer's task bar. Notify me on errors Check this option if you would like to be notified of errors. 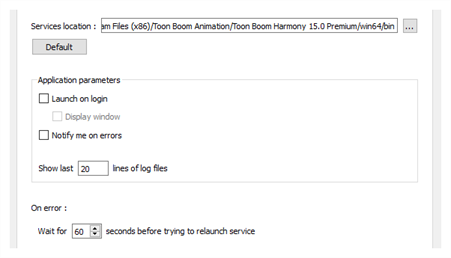 Show last lines of log files Allows you to enter the maximum number of lines from the bottom of the log file that you would like displayed for the ToonBoom Process, Database Server and WebCC services. On error Allows you to enter the number of seconds that the Service Launcher should wait before trying to relaunch any of services, should they happen to stop.